Pharaon Island is part of the Tentative list of Egypt in order to qualify for inclusion in the World Heritage List. 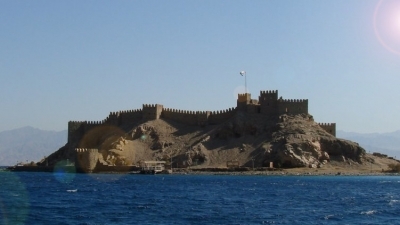 Pharaoh's Island is a tiny island off the coast in the Gulf of Aqaba, between Sinai and Jordan. You can't miss it when you travel north from Sharm to the ferry towards Jordan. I strongly assume the inscription is for the crusader castle, now called Salah El Din Citadel, that takes up most of the space on the island as seen in the picture. To get across one has to take a small fishing boat but it's a really short ride. Most people on the tour didn't bother going and just took pictures from the coast. I suppose in retrospective that would be good enough for me too but at the time it was nice to get off the bus (the ferry port is actually just 5 more minutes north where you get off anyway). The ascend into the citadel in the heat is not much fun but you can find plenty of shade inside the walls. There is not much left to see but they point out certain spots where that were supposed to be sleeping quarters etc. The trip was not even an hour and most were eager to go back anyway. Seeing this gearing up for an inscription makes me wonder if the island is enough. The official description is appalling and surely won't make the cut. They still have a couple of years to get this done I suppose. This is place is actually also being considered as a Crusader Fortress inscription along with El-Gendi Fortress which makes more sense for an inscription. I would rather go scuba diving around the island but seeing that it was on the way I didn't mind the short side trip before going into Jordan.